​ The Dexter cross country team traveled to Belfast to compete in the Northern Regional XC Championship along with Orono, Bucksport, Calais, Houlton, Mattanawcook, Greater Houlton, George Stevens, Narraguagus, MSSM, Lee Academy, Washburn, Fort Kent, Central, Searsport, Madawaska. The Tigers did not finish in the top 5. For Dexter, the best runner of the day was sophomore Michael Gadwah who finished 46th with a time of 20:46.49. Next, was freshman Nickolas Gallighan who finished 84th with a time of 23:16.82. In 93rd, was freshman Clyde Day who had a time of 25:38.91. The best runner of the day was Evan Merchant of Jonesport-Beals HS who finished with a time of 17:30.67. The runner who finished last in the relay was Noah Carver of Jonesport-Beals HS with a time of 30:10.85. The Men’s Dexter track team traveled up north for a meet in Presque Isle that included 57 runners that were from Lee Academy, Orono, Foxcroft, Mount Desert, Bucksport, Ellsworth, John Baptist, Hermon, and Caribou. The Men did not finish in the top 5. For Dexter, The JV meet had freshman Miles Gadwah, freshman Nickolas Gallighan, freshman Clyde Day, and Junior Ryan Boisvert. Dexters top runner was Miles Gadwah who finished 38th with a time of 23:44.2. In 40th, was Nickolas Gallighan with an time of 24:16.3. Clyde Day came in 49th with a time of 26:14.2. Lastly, The oldest of the runners for Dexter, Ryan Boisvert, came in 51st with a time of 26:52.8. For JV, the best runner of the day was Owen Shaw of Hermon who finished with a time of 19:19 flat. The runner who crossed the finish line last was Nasuh Algul of Orono who finished with a time of 29:58.3. The Dexter Tigers men’s Cross Country team traveled to Old Town to compete in a 3 mile run. Dexter did not finish in the top 5 in either race. For JV, only 2 runners for Dexter competed in the meet. Freshman Nickolas Gallighan finished in 39th with a time of 23:37.19. Junior Ryan Boisvert finished in 25:57.32. For varsity, Only one runner for Dexter ran, sophomore Michael Gadwah who finished in 56th with a time of 21:20.61. For Varsity, Hermon had the best total time with 1:43:46.99. For varsity, Hermon also won that race with a total time of 1:31:04.52. The Dexter Tigers men’s cross country team traveled to Foxcroft to run. The Tigers did not finish in the top 5. The top runner for the Tigers was sophomore Michael Gadwah who came in 26th with a time of 22:13.77. Next,freshman Nickolas Gallighan who finished 37th with a time of 24:04.09. Then, the 2 freshman finished 43rd and 44th with Clyde Day finishing in 43rd with a time of 27:14.77 and Miles Gadwah in 44th with a time of 28:41.07. The Dexter Tigers Cross Country team traveled to Bucksport to compete in a meet. Dexter did in fact finish in the top 5. For JV ,sophomore Michael Gadwah came in 2nd place with a time of 21:18.85. Freshman Nicholas Gallighan came in 8th with a time of 22:52.24. Freshman Miles Gadwah finished 12th with a time of 23:46.14. Freshman Clyde Day finished 17th with a time of 24:59.12. Freshman Miles Gadwah also competed in the varsity meet finishing in 28th with a time of 23:46.14. 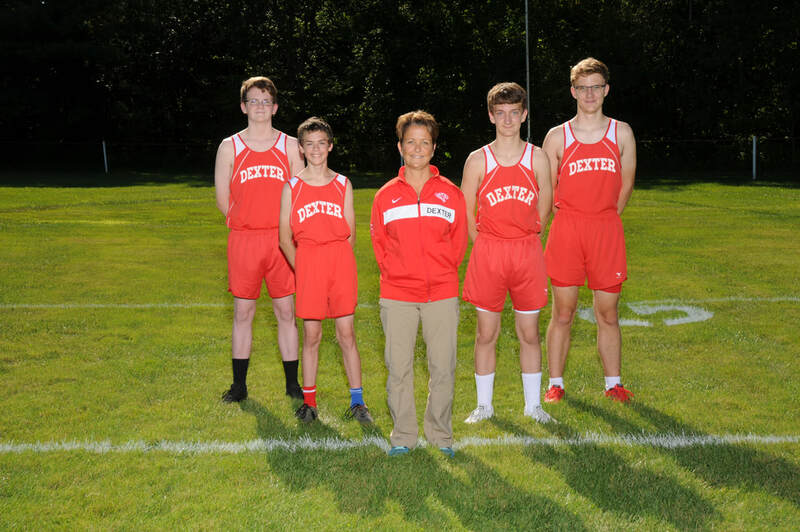 The Dexter Tigers men’s cross country team traveled to Ellsworth High School to compete in a track meet. the boys did not finish in the top 5. For the Tigers, the top runner was sophomore Michael Gadwah who finished 19th with a time of 22:32 in a 5k race. Freshman Nicholas Gallighan finished 38th with a time of 24:51, freshman Miles Gadwah finished 42nd with a time of 25:19, and freshman Day Clyde finished 43rd with a time of 25:25.